All interpolation methods require that x be monotonic along each row, and all rows must be identical. Otherwise, this node uses only the first row of x to perform the interpolation. If x is not empty, the number of columns in x must equal the number of columns in z. If x is empty, this node treats x as an array whose size equals the size of z and whose rows are [0, 1, …, N - 1], where N is the number of columns in z. All interpolation methods require that y be monotonic along each column, and all columns must be identical. Otherwise, this node uses only the first column of y to perform the interpolation. If y is not empty, the number of rows in y must equal the number of rows in z. If y is empty, this node treats y as an array whose size equals the size of z and whose columns are [0, 1, …, M - 1]T , where M is the number of rows in z. Number of times that this node interpolates values repeatedly and evenly between each x and y element to generate xi used and yi used. ntimes determines the locations of the interpolation values. If you wire data to xi or yi, this node ignores ntimes. Values of the independent variable in the x domain where interpolated values of the dependent variable are to be computed. Values of the independent variable in the y domain where interpolated values of the dependent variable are to be computed. Interpolated values of the new points that correspond to the independent variable values. Values of the first independent variable at which interpolated values of the dependent variable are computed. If you wire data to xi, xi used returns xi unchanged. Otherwise, xi used returns an array with identical rows of 2ntimes - 1 points located evenly between each two adjacent elements in the first row of x, and the number of rows in xi used equals the number of rows in yi used. Values of the second independent variable at which interpolated values of the dependent variable are computed. If you wire data to yi, yi used returns yi unchanged. Otherwise, yi used returns an array with identical columns of 2ntimes - 1 points located evenly between each two adjacent elements in the first column of y, and the number of columns in yi used equals the number of columns in xi used. 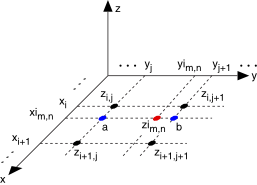 The bilinear interpolation method sets the interpolated values to points along the line segments that connect x and y. With the bilinear interpolation method, this node calculates the 1D linear interpolation twice along the x-axis and returns the interpolated values at points a and b, represented by the blue dots in the following figure. This node then calculates the 1D linear interpolation along the y-axis, represented by the line segment that connects a and b in the following figure, and returns zim, n.